How Do Loan Scams Work? Loan scams are an unlawful practice that can result in identity theft and damage to a victim's financial history. Loan scammers always require an advance fee in order to secure the loan. However, it is illegal for any lender to charge any upfront fees in order to release the loan. Legitimate lenders are only allowed to add fees to the loan amount and to be paid overtime for the consumer's protection. 1. Scammers may purchase their leads from legitimate marketing websites. These marketing websites are not in the business of loaning money, which generally requires a license. They are simply professional-looking webpages offering loans to consumers and are very misleading. Once the form has been submitted, the information generally is sold to a third party loan provider for a fee. Even if the loan website looks very professional and trustworthy, it may not protect your information from ending up in the hands of scammers. This information may include your home address, banking information, and social security number. 2. There are certain cases where scammers actually create their own loan application websites, although most of their websites look very unprofessional. These fake websites can be easy to detect by webpage errors. 2. Domain name ownership protected by privacy. 4. Not using HTTPS secure protocols, which is a must for any website collecting information. Ok! They’ve Got My Info, What Do I Do Next? At some point, scammers will try to get in contact with the person seeking a loan. Scammers will then offer a loan using very favorable terms, regardless of the victim's credit score. The scammers will make victims believe that they’ve already been approved for a loan, but they must pay a fee up-front in order for the loan to be released. As a general rule of thumb – if the fee is required up-front, it’s a scam! If you've been targeted by a loan scammer or have entered your information on such "loan" websites, the chances are that your sensitive personal information is in the hands of scammers. This dangerous practice can occur even if you didn’t get scammed the first time. Unfortunately, it is only a matter of time before identity theft occurs. ATTENTION: Consumers who have been contacted by loan scammers could have had their personal information breached. #REPORTSCAM highly recommends that consumers whose information has been breached obtain identity theft protection service immediately. There are several companies that offer identity theft protection in the US. 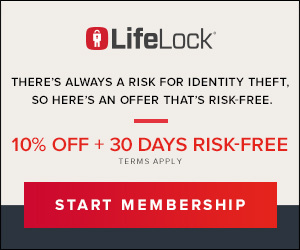 One of the most inexpensive options we were able to find is the protection offered by LifeLock. You can start your protection here.